1. A Life Uncorked, wine writer Hugh Johnson will sign copies of his latest book, A Life Uncorked, Thursday, April 27, 5:00 p.m. at Astor Wines & Spirits, 399 Lafayette Street (212.674.7500). 2. Taste of the Lower East Side, annual tasting event featuring food and drink from more than 35 Lower East Side restaurants, benefiting the Grand Street Settlement's youth programs, Thursday, April 27, 7:00 to 11:00 p.m., at The Puck Building, 295 Lafayette Street. $120/person, tickets sold at the door (212.674.1740). 3. 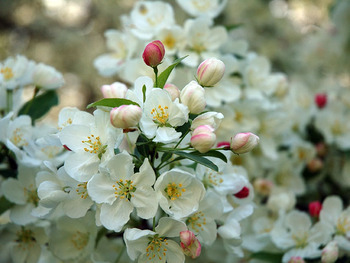 Sakura Matsuri, the Brooklyn Botanic Garden's annual cherry blossom festival will feature a number of workshops and demonstrations on Japanese food -- from tofu to green tea and sweets, Saturday, April 29, and Sunday, April 30, at the Brooklyn Botanic Garden, 1000 Washington Avenue. Free, with admission to the Garden (718.623.7200). 4. Pippin Party, Slow Food NYC will host a day trip to the Stone Barns Center for Food and Agriculture to celebrate the planting of Newtown Pippin apple trees, the only American heirloom apples native to New York City, Saturday, April 29, 2:00 p.m. to 4:30 p.m. $25/Slow Food members, $35/non-members (apples@slowfoodnyc.org). 5. jen@joe: A Collaboration of Art + Coffee, Joe the Art of Coffee will hold an opening reception for an exhibit of photographs from the jen bekman gallery, Sunday, April 30, 2:00 to 4:00 p.m., at Joe the Art of Coffee, 9 East 13th Street (212.924.7400). 6. Dining for Darfur, restaurants participating in this charity dine out event will donate five percent of their sales on Sunday, April 30, to support the International Rescue Committee’s humanitarian relief efforts in Darfur. 7. Taste of the Nation: New Jersey, Share Our Strength’s annual fundraising event, featuring dishes from more than 40 New Jersey restaurants, will take place on Monday, May 1, 6:00 p.m., at The Madison Hotel, One Convent Road, Morristown, New Jersey. $75/in advance, $85/at the door (973.772.4474). 8. Fifth Annual Calçotada, Savoy restaurant will celebrate the return of spring with its version of Northern Spain’s Calçotada, a traditional community-based festival, Tuesday, May 2, 6:00 p.m., at Savoy restaurant, 70 Prince Street. $75/person, plus tax and gratuity (212.219.8570). 9. The Cuisine of Queens & Beyond, annual festival featuring dishes from more than 45 restaurants, gourmet shops, bakeries, and wine and beer companies, Tuesday, May 2, 6:00 p.m. to 9:00 p.m., at the Astoria World Manor, 25-22 Astoria Boulevard, Astoria. (718.777.7918). It's that time of year where I get up early and -- camera in hand -- take a meandering walk through Central Park on the way to work in an attempt to capture the riot of spring color. Luckily, I took these photos last Thursday morning, when the weather was still beautiful. Who knows how these flowering trees fared after this wet and windy weekend. Warning: This post has absolutely nothing to do with food. It's an unabashed plug for my cousin Rebecca's new documentary Stolen, which opens today with a premiere theatrical engagement at New York's Cinema Village (22 East 12th Street at University Place) from Friday, April 21, through Thursday, April 27 [Update: The film has been held over for additional screenings through Thursday, May 4]. 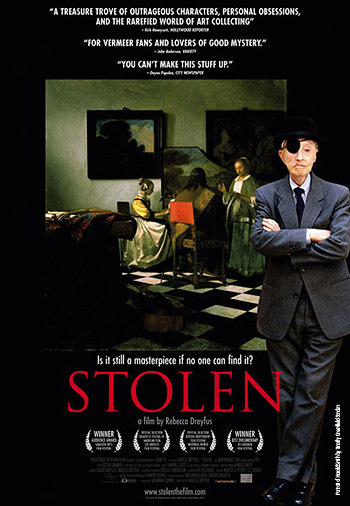 Stolen explores the the 1990 art theft at Boston's Isabella Stewart Gardner Museum, where thieves escaped with 13 of the collection's paintings. The stolen art included works by Rembrandt, Degas, and Manet, and, perhaps most notably, Vermeer's "The Concert," one of only 35 surviving works by the Dutch master. New York magazine film critic David Edelstein calls Stolen "haunting and expansive." For more information about the film, including a trailer and showtimes at select theaters across the country, visit the Stolen website. 1. From the Farm to the Farmer's Market, The New School will present a roundtable discussion on sustainable agriculture in the New York metropolitan region, Wednesday, April 19, 6:00 p.m., at The New School, 66 West 12th Street, Room 510. Free (silvap@newschool.edu). 2. Adventures in the Spice Trade, The Stony Brook Center for Wine, Food, and Culture will present a discussion of the medieval spice trade led by Yale Professor Paul Freedman, along with a tasting of foods prepared by Suvir Saran, executive chef at Devi, Thursday, April 20, 7:00 p.m. to 8:30 p.m., at Stony Brook Manhattan, 401 Park Avenue South at 28th Street.$55/person (631.632.9404). 3. Taste of Chinatown, Food festival featuring more than 50 Chinatown restaurants, tea houses, bakeries and specialty food shops, Saturday, April 22, 1:00 p.m. to 6:00 p.m., at Mott, Mulberry, Baxter, Bayard, Pell, Doyers, and Mosco Streets. $1.00 and $2.00 per tasting plate (info@explorechinatown.com). 4. Greek Easter Lamb Roast and Midnight Feast, Estiatorio MILOS will roast 16 lambs to create a traditional midnight Greek Easter dinner, Saturday, April 22, at Estiatorio MILOS, 125 West 55th Street. $90/person (212.245.7400). 5. Chef Tasting Series, Appellation Wine and Spirits will present a tasting of dishes from Tia Pol restaurant paired with Sherry, Tuesday, April 25, 6:00 p.m. to 7:00 p.m. or 7:00 p.m. to 8:00 p.m., at Appellation Wine and Spirits, 156 10th Avenue. Free (register via email at info@appellationnyc.com with subject "Tia Pol Tasting" and the time you would like to attend, or call 212.741.9474). 6. If You Knew Sushi Like We Know Sushi, former New York Times food critic Mimi Sheraton will moderate a panel discussion on Japanese culinary trends and the history and impact of Japanese food in the U.S., Tuesday, April 25, 7:00 p.m. to 9:00 p.m., at the Asia Society, 725 Park Avenue, New York Cost: $30/members, $60 nonmembers (212.517.ASIA). 7. Cheese by Hand Benefit, Vintage New York will host a benefit and kickoff event for Cheese by Hand, a new documentary project on American artisanal cheesemaking, Tuesday, April 25, 6:30 p.m. to 8:30 p.m., at Vintage New York, 482 Broome Street. $75/person (rsvp@cheesebyhand.com). Passover desserts always strike me as antithetical to the whole "remember we were slaves in Egypt" theme of the holiday. Sweetness is typically on overload either to compensate for the absence of flour or to cover up the use of matzo as an ingredient. It's particularly hard to reflect on suffering while eating these Belgian Brownies, for example, which boast nine ounces of chocolate, more than eight ounces of butter, five eggs, and over a cup of sugar. The dessert comes from Belgian bakery chain Le Pain Quotidien, and the recipe originally appeared in the Los Angeles Times Culinary SOS column. The recipe has since mysteriously disappeared from the newspaper's online archives. However, thanks to Los Angeles Times/New York Times recipe chronicler Luisa, you can find the recipe over at her blog, The Wednesday Chef. I followed the instructions with one minor modification, substituing matzo cake meal for the scant three tablespoons of flour called for in the original recipe. I wondered how the matzo flour would work as a substitute, but the recipe turned out fantastic . 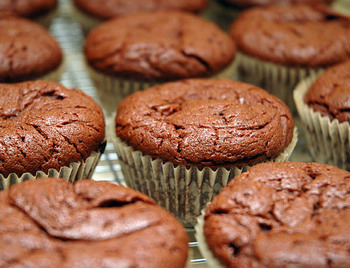 . . and fantastically rich (each little cakelet contains a whopping 326 calories and 24 grams of fat!). Warm from the oven, they resemble a crumbly version of a molten chocolate cake. After they cool, the caps deflate a bit, leaving a slightly denser, but still moist center beneath the crackled top. The only thing that might make them better would be some ice cream on the side. As the Haggadah says, next year in Jerusalem! 1. Cherry Blossom Tasting Menu, Chef Josh DeChellis will create a spring menu featuring cherry blossoms as an ingredient, served through Tuesday, April 18, at Sumile, 154 West 13th Street. $65/person (212.989.7699). 2. Passover Dinner, Savoy restaurant will feature a Passover dinner featuring Italian Jewish cuisine, Wednesday, April 12, and Thursday, April 13, at Savoy, 70 Prince Street. $95/person (212.219.8570). 3. Alpine Cheese & Wine Tasting, Fromagères Waldemar Albrecht and Nadia Muna Gil will pair Alpine cheeses with wine, Thursday, April 13, 6:00 to 7:30 pm at Swizz, 310 West 53rd Street. $75/person (646.246.3499). 4. Easter Sunday Dinner, Savoy follows Passover with its first Easter Dinner on Sunday, April 16, at Savoy, 70 Prince Street. $65/person (212.219.8570). 5. Beer Dinner, Riingo will present a three course dinner paired with beers from Nantucket's Cisco Brewers, Monday, April 17, 7:30 p.m., at Riingo, 205 East 45th Street. $55/person (212.867.4200). V for Vendetta is a mixed bag of a movie. While thoroughly entertaining, the film is a hodgepodge of mixed messages and muddled metaphors (summed up nicely in this review). One particularly peculiar symbol of resistance against the fascist state is the "eggy in a basket" (aka "bird in a nest") breakfast cooked up by the film's anti-hero terrorist, V. Depicted as some sort of suppression of pleasure, butter and eggs have been outlawed (or at least rationed) in this vision of the future. "They don't know what British people have for breakfast, they couldn't be bothered. 'Eggy in a basket' apparently. 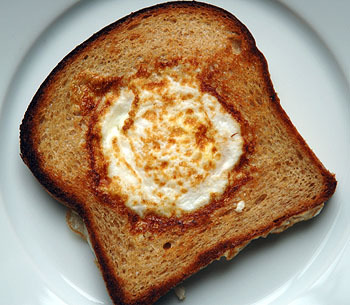 Now the US have 'eggs in a basket,' which is fried bread with a fried egg in a hole in the middle. I guess they thought we must eat that as well, and thought 'eggy in a basket' was a quaint and Olde Worlde version." In the pantheon of science fiction fantasies of future food, V for Vendetta's breakfast occupies an unusual place. At one end of the spectrum is the world of Woody Allen's Sleeper, where fried, fatty foods are not only accepted, but considered supremely healthy. At the other end is Soylent Green, where we all end up feeding upon (spoiler alert!) ourselves ("Soylent Green is people!"). My own preferred vision of sci fi food culture is in Blade Runner, which finds Harrison Ford slurping noodles in a fantasy version of downtown L.A. as a neon-lit mashup of Tokyo, New York, and Hong Kong. Even in a future where humans are under attack by android replicants, there will still be noodles to savor. 1. Dine in Brooklyn, participating Brooklyn restaurants are serving three course meals for $20.06. The dining promotion continues through Tuesday, April 11. 2. Shad Bake, Savoy restaurant's special four course menu featuring shad and shad roe continues through Sunday, April 9. Get your shad on at Savoy, 70 Prince Street. $55/person or $75/person for dinner paired wines (212.219.8570). 3. Food & Fiction, the American Institute of Wine and Food will present a panel discussion on food and literature featuring Kate Christensen, author of The Epicure’s Lament and In the Drink, Paulette Licitra, Editor of Alimentum, Tim Stark, author and owner of Eckland Farms, and Fred Kaufman, Professor of English, CUNY, Wednesday, April 5, 6:30 p.m. to 8:30 p.m., at the New York City College of Technology, HM Department, Namm 215, Janet Leftler Dining Room, 300 Jay Street, Brooklyn. $15/person (718.229.6565). 4. Whisky Live, Whisky magazine will present a tasting event "intended to provide the ultimate whisky experience," Wednesday, April 5, 5:00 p.m. to 12:00 a.m., at Tavern on The Green. Central Park at West 67th Street. Visit whiskylive.com for more event and ticket pricing information. 5. Wedding Wine Tasting, The Greene Grape Downtown will hold a special tasting of crowd-pleasing red, white, and sparkling wines under $15, Thursday, April 6, 5:00 p.m. to 7:00 p.m., 55 Liberty Street (212.406.9463). 6. Stinky Cheese, fromager Waldemar Albrecht will lead a discussion and tasting of washed-rind cheeses paired with wine, Thursday, April 6, 6:30 p.m. to 8:30 p.m., at the Artisanal Premium Cheese Center, 500 West 37th Street, 2nd Floor. $75/person (877.797.1200). 7. Chocolate Seder, MAKOR will present an all-chocolate mock Passover seder, Thursday, April 6, 7:00 p.m., at the Steinhardt Building, 35 West 67th Street. $18/person (212.415.5500). 8. Words of Honey, cheese specialist Sasha Davies from Murray's Cheese and Zeke Freeman from Bee Raw Honey will present a discussion and tasting of honey, April 6, 7:00 p.m. to 9:00 p.m., at Red Flower, 13 Prince Street. Free (rsvp to 13prince@redflower.com or 212.966.5301).